Contenders for Indian fighter deal to show in force at Aero India 2011. All six participants of a tender to supply 126 light fighter jets to the Indian air force will showcase full flight displays at Aero India 2011 air show, the organizers said. Six major aircraft makers — Lockheed and Boeing from the United States, Russia's MiG, France's Dassault, Sweden's Saab and the EADS consortium of British, German, Spanish and Italian companies — are in contention to win the $11 billion tender. Each company is expected to bring along at least two competing aircraft as well as competent teams and flight simulators for display. Russia's contender, the MiG-35 Fulcrum-F, is an export version of the MiG-29M OVT fighter jet. It is a highly maneuverable air superiority fighter, which has already won high acclaim among aircraft industry and military experts. The fighter is powered by RD-33 OVT thrust vectoring engines. The RD-33 OVT engines provide superior maneuverability and enhance the fighter's performance in close air engagements. India is expected to make its choice in July this year. 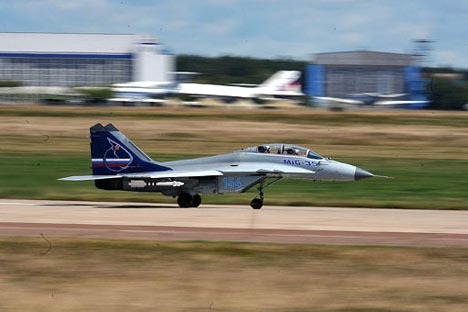 Moscow earlier said if MiG-35 wins the tender, Russia is ready to transfer all key technology to India's Hindustan Aeronautics Ltd. and provide assistance for the production of the aircraft in the country. Aero India-2011, which will be held in the southern city of Bangalore on February 11-15, is most likely to attract the record number of leading manufacturers, vendors and suppliers from 63 countries.